The Museum of Arts and Design will present LOOT 2012: MAD about Jewelry, its juried selling exhibition of artist-made jewelry for four days this October. Now in its 12th year, LOOT: MAD about Jewelry has become known as the ultimate pop-up shop for contemporary art and studio jewelry by both artists and collectors alike; it affords the public the rare opportunity to acquire pieces directly from some of the most innovative jewelry artists in the world. This year, the creations of 50 emerging and acclaimed jewelry artists will be on sale. Prices will range from $200 to $12,000, with $1000 the average. Proceeds from the selling show will benefit the Museum’s exhibition and education programs. LOOT 2012: MAD About Jewelry, the ultimate pop-up shop for contemporary art and studio jewelry, whose proceeds benefit the Exhibition and Education programs of the Museum of Arts and Design (MAD Museum), will run from Tuesday through Saturday, September 11 – 15, 2012. Unlike any other jewelry event in the country, LOOT 2012 gives jewelry lovers the opportunity to meet some of the most innovative creators in the field and acquire work directly from them. This 12th edition of LOOT will be the largest and most international ever, with jewelry by more than 50 emerging and acclaimed artists, hailing from 12 countries. It will also showcase the work of jewelry students from New York’s own Fashion Institute of Technology. Like last year, the exhibition and sale has been curated by Bryna Pomp, a jewelry specialist, and Nancy Olnick, a noted collector; they selected the artists for their originality, use of materials, and expert craftsmanship. Much effort was also made to find distinguished artists from around the world. 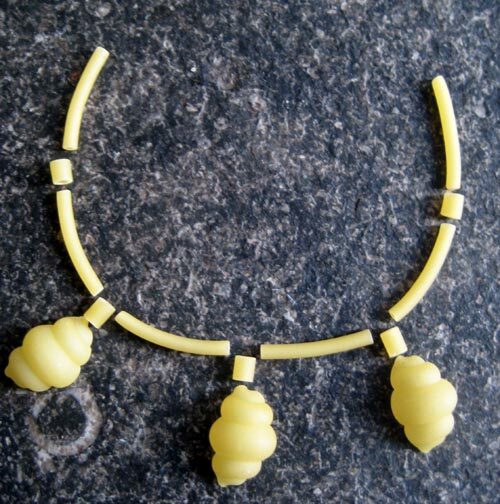 Among those in this year’s roster will be the acclaimed German bead artist Axel Russmeyer, who in addition to participating in the exhibition and sale will be awarded the inaugural LOOT Award for Contemporary Art Jewelry. This annual prize is in keeping with the long-standing commitment of the Museum of Arts and Design to presenting jewelry as an art form. MAD is the only American museum to possess a gallery dedicated to the display of both temporary jewelry exhibits and its own collection of contemporary and modern studio and art jewelry, which it began assembling soon after its founding in 1956.
collection of timepieces, specifically designed for the exhibition. In Europe, this Czech artist is as well known for her tabletop, lighting, and furniture designs, as for her minimalist art jewelry. The chair of the metals department at Prague’s Academy of Arts, Architecture, and Design, she will bring along the work of six of her top students, two of whom will be in attendance. A sculptor as well as a jeweler, this British artist works in Perspex and a variety of metals to create wearable objects that evoke the motion and pattern of waves. Working in agate, oxidized silver, and gold, this Belgian-born, Dusseldorf based artist uses minimalist details to the maximum effect. This British artist makes jewelry from carved out book pages, which he laminates and polishes. The excavated tome then serves as the jewelry container. 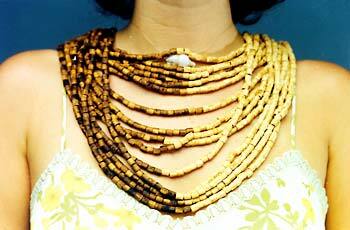 Tasmania, makes striking wearable sculpture. This Philadelphia-based artist makes enigmatic hand-painted enamel brooches inspired by old photographs. This Bulgarian artist jeweler creates a rigid meshwork out of clusters and layers of circles in silver and gold. While the geometry is simple, the effect is rich in pattern and density. Dominique Labordery –necklace made out of agate, oxidized silver, and gold. 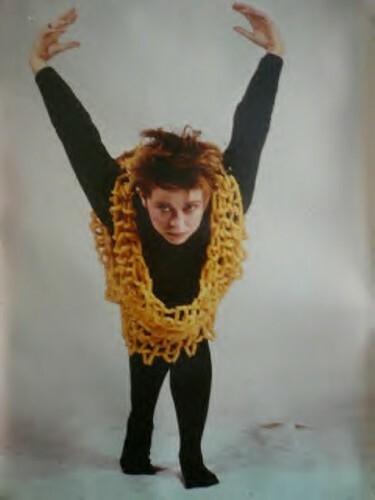 & when doing a search about Sustainable Jewellery …. 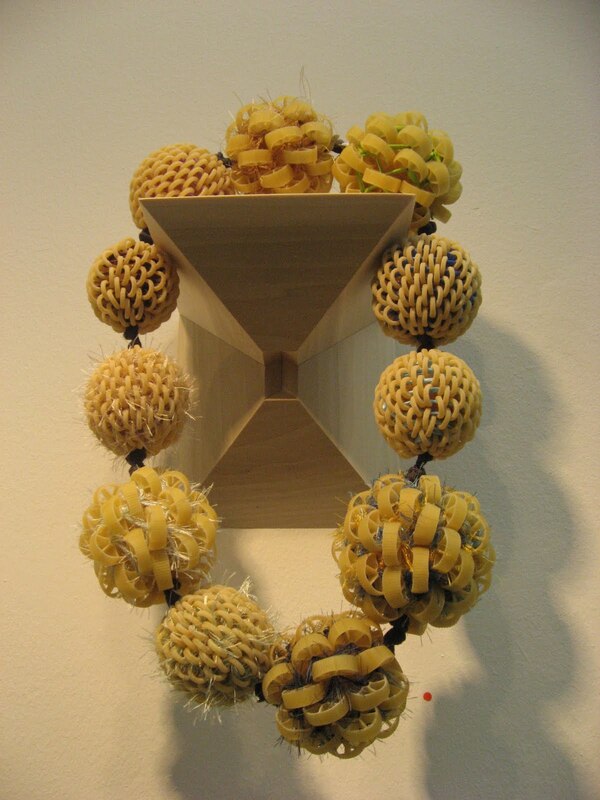 Christophe Marguier- « Mother’s day » – 2005 – pâtes alimentaires câbles acier fermoir argent – dimensions variables – le collier de nouilles revisité. Où l’objet utopique devient portable et porté. 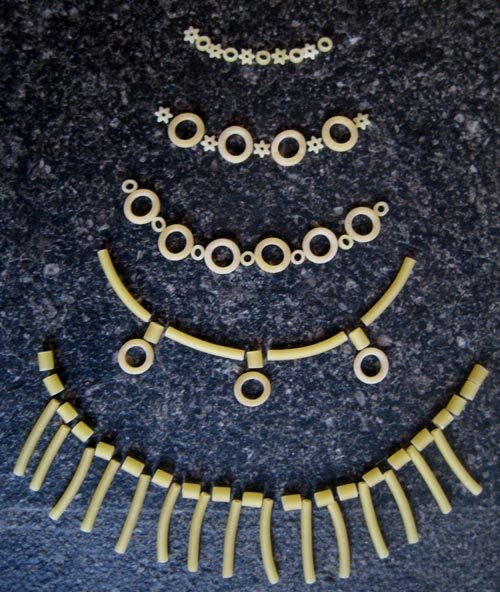 Agnès Propeck : “Le collier de la Reine”- collier géant d’un mètre par un mètre entièrement composé de pâtes alimentaires. « Depuis l’invention de la coquillette et de la pâte alphabet – merci Rivoire & Carret -, il n’est pas une maman qui se soit vue régalée, à l’occasion de la fête annuelle consacrant son statut, du sempiternel collier enfilé nouille après nouille par la chair de sa chair, le sang de son sang. Inscrite depuis la maternelle au programme des travaux pratiques dits d’éveil, cette nouillerie annuelle peut aussi prendre l’allure d’un « Maman je t’aime » en vermicelles à la sauce tomate séchée sur fond de papier de crèche avant de se transformer en travail du galet pour vide-poches (ça c’est pour la fête des Pères), nettement plus embarrassante. 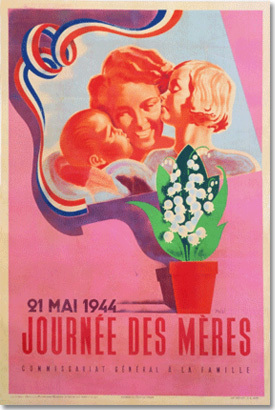 Bonne nouvelle pour toutes les mamans ! Elles pourront dorénavant revendre les colliers de pâtes offerts par leurs marmots au prix de bijoux Dolce&Gabbana (bracelet et b.o. Dolce&Gabbana 2012) ! bon, c’est bien d’être « sustainable », mais un peu de « bling » de temps en temps ne nuit pas à l’humeur …. PS : et si VRAIMENT vous manquez d’idées et une envie furieuse de collier de pâtes vous démange, voici un lien avec modèle DIY ! 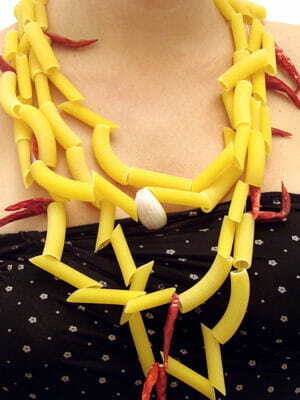 DIY tutotrial for chevron pasta necklace ….